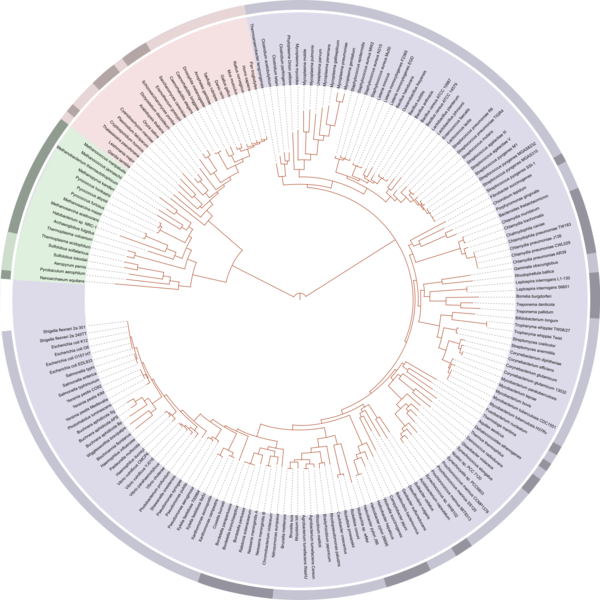 A phylogenetic tree of life, showing the relationship between species whose genomes have been mapped by humans. The very center represents the last universal ancestor of all life on earth. The different colors represent the three domains of life: pink represents eukaryota (animals and plants); blue represents bacteria; and green represents archaea. Our species (Homo sapiens) is second from the rightmost edge of the pink segment. The light and dark bands along the edge correspond to clades: the rightmost light red band is Metazoa, with dark red Ascomycota to its left, and light blue Firmicutes to its right. 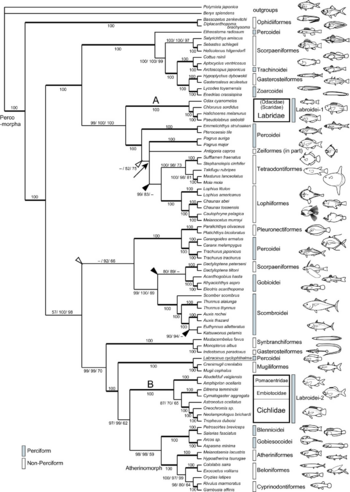 Phylogenetic relationships among the Labroid families of fish, based on whole mitochondrial DNA sequences. Note that the species of the Labridae and those of the remaining three labroid families (Cichlidae, Pomacentridae, and Embiotocidae) form different monophyletic groups, respectively. This page was last modified 19:39, 23 May 2010.